A Unique Toy for All ages. Introducing Hide & Seek Safariâ„¢. The folks here at R & R Games have brought the childhood classic "Hotter, Colder" into the 21st Century. Use the Seeker wand to track down and catch this elusive Tiger. Lights flash to show youâ€™re getting warmer and the Seeker will sound when the Tiger is near! 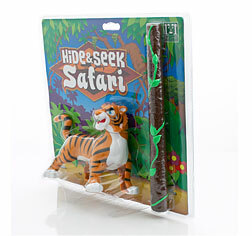 Other products in the "Hide & Seek Safari" series.